Located on the banks of the Kopuawhara Stream, the no. 4 camp accommodated workers building the Wairoa–Gisborne railway. Houses for married men were on higher ground, with a cookhouse and huts for single men closer to the riverbank. Although the stream was in flood after heavy rain, the 5-m-high wall of water that hit the camp sometime after 3 a.m. took everyone by surprise. Water began pouring across the campsite, sweeping away everything in its path. Some men took refuge on the roofs of huts, but most of these structures collapsed. Those who climbed onto the roof of the cookhouse managed to hang on until they were rescued at daybreak. The 11 men who took refuge in one of the work trucks were not so lucky. The force of the water tossed it onto its side and swept its occupants away; rescuers found remnants of the vehicle 12 km downstream. 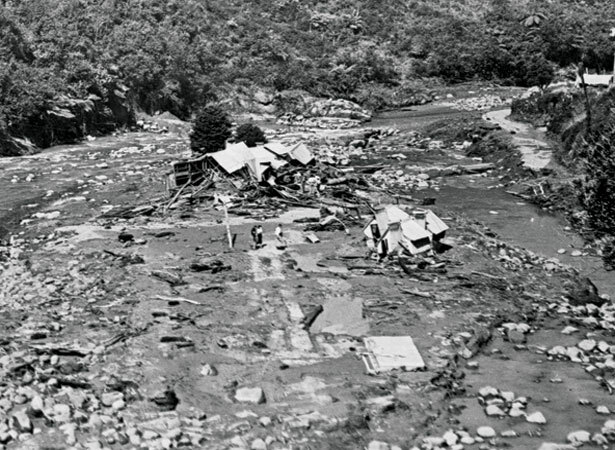 We have 8 articles, related to Kopuawhara flood kills 21 .